I remember seeing a recipe for super-smooth hummus a few years ago that called for peeling the skins off of each chickpea before purèeing them, but, really, who has time for that? Someone has to knit all those stripey socks for our hedgehog and that takes up a lot of time! Note: you can absolutely use canned chickpeas for this recipe. It won’t be quite as ethereally smooth, but it will still be extremely tasty. 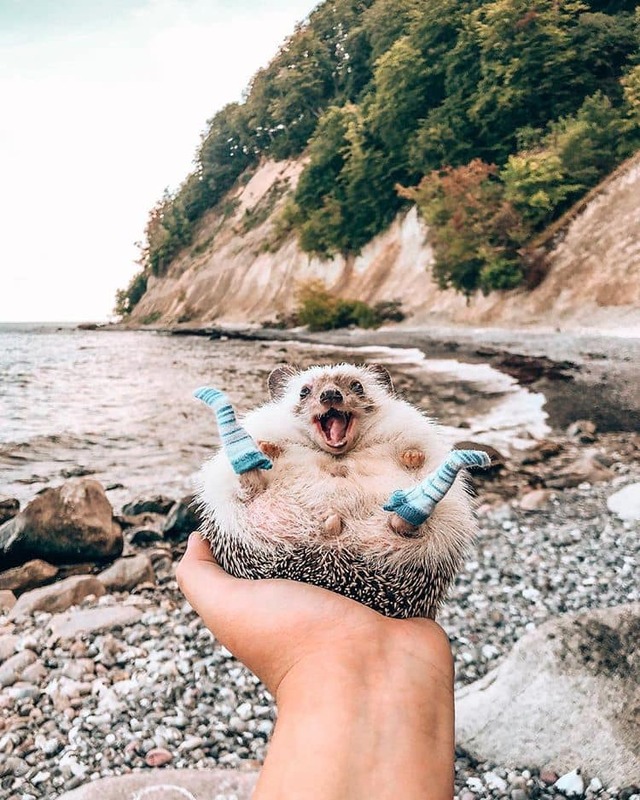 Disclaimer: this is not our hedgehog, or our photo, and we don’t know how to knit. We’re very sorry, three times. 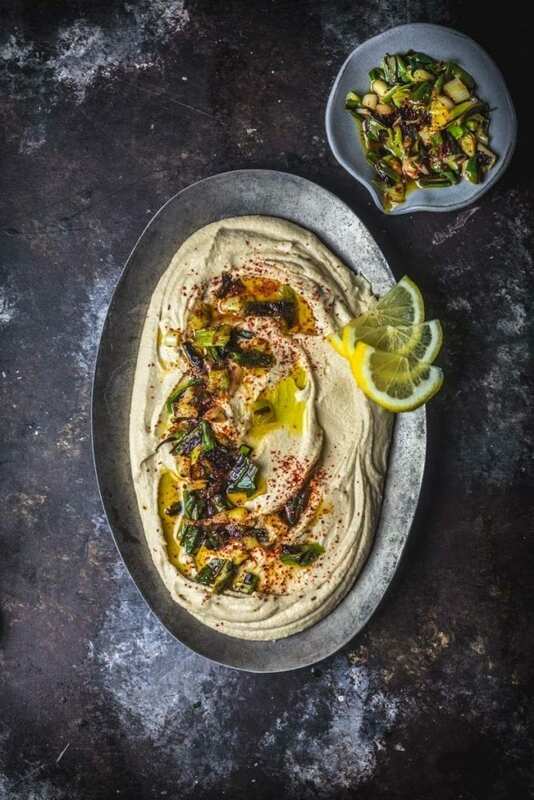 We use Solomonov’s method of using baking soda, both when soaking and when cooking the chickpeas, which breaks the skins down and creates an extra silky and rich purée (Yotam Ottolenghi & Sami Tamimi also use this method in their hummus from the book Jerusalem, another favorite of ours). The baking soda soak also speeds up the cooking time by about half an hour, another fringe benefit. Here’s the process. Start the evening before you cook, as you’ll want to do an overnight soak. Add the chickpeas to a bowl and cover them with two to three times their volume of cold water. Stir in the baking soda and leave them at room temperature overnight. The next day, drain the soaked chickpeas and rinse with cold water. Then add them to a pan with about 6 cups of water, with another added teaspoon of baking soda and a little salt, and simmer until they’re so tender they just about fall apart (over-cooked chickpeas are one of the keys to a super-smooth hummus). This will take between 20-40 minutes, depending on the freshness of the beans. While simmering, there may be some foam on the surface which you should skim off every so often. 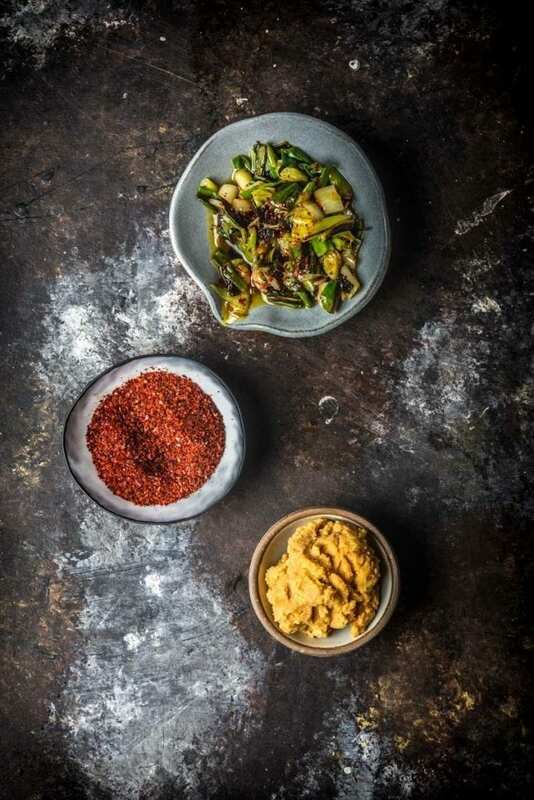 What makes our ultra-smooth hummus extra tasty is the added miso, along with a topping of charred scallions and Korean spicy pepper. While the chickpeas are cooking, you can whip up the lemon and garlic mixture. If you have one of those fancy, high-speed blenders (I’m obsessed with our newly acquired refurbished Vitamix), this is a great place to use it but a food processor will work fine too. The main thing is that you want the garlic to be completely puréed in the lemon juice, as finely as possible (no one wants to bite on a chunk of raw garlic), and then let the mixture rest in the blender for 10 minutes. The acid in the lemon juice neutralizes most of the enzymes in the garlic that give it its pungency, leaving the flavor much more mellow. 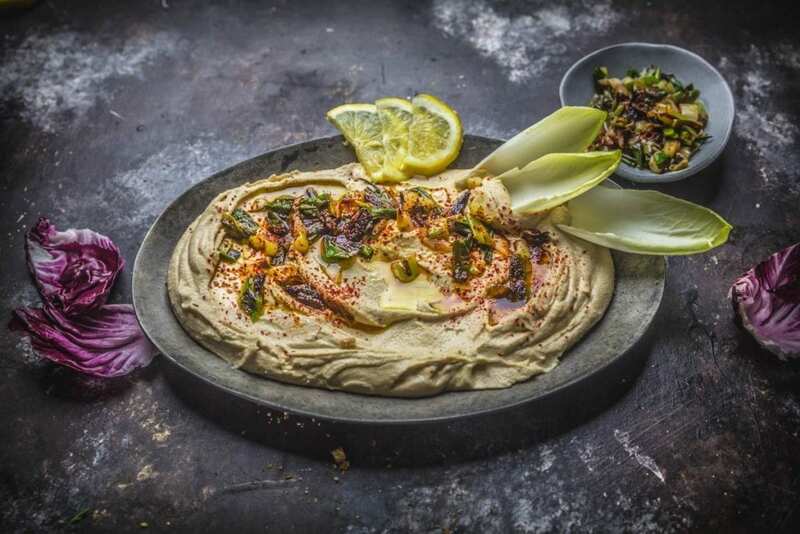 Once the garlic and lemon have mellowed, add the tahini, miso and cumin and give it a whirl. Then add the hot, drained chickpeas* and whip that sucker until it’s light and airy and smooth as frosting. If the mixture is too thick, you can pour in a little water until it’s blendable. *Be careful blending hot ingredients. Take the stopper off the top of the blender and hold a tea towel over the opening to allow steam to escape. The last step is the charred scallions, which are now officially my new favorite thing. I like to use a cast iron skillet for this but any good, heavy pan will do. Get the pan nice and hot, add a little oil, lay the whole, uncut scallions in and let them char up on one side. Turn them and brown them on the other side. The whole process will only take a few minutes. Take them out and lay them on a cutting board and let them sit until they’re cool enough to handle. Slice them into half-inch sections, add them to a small bowl and season them up with salt, a good sprinkling of either gochugaro (Korean chili flakes), an Alepp0-style pepper or good old regular red pepper flakes. 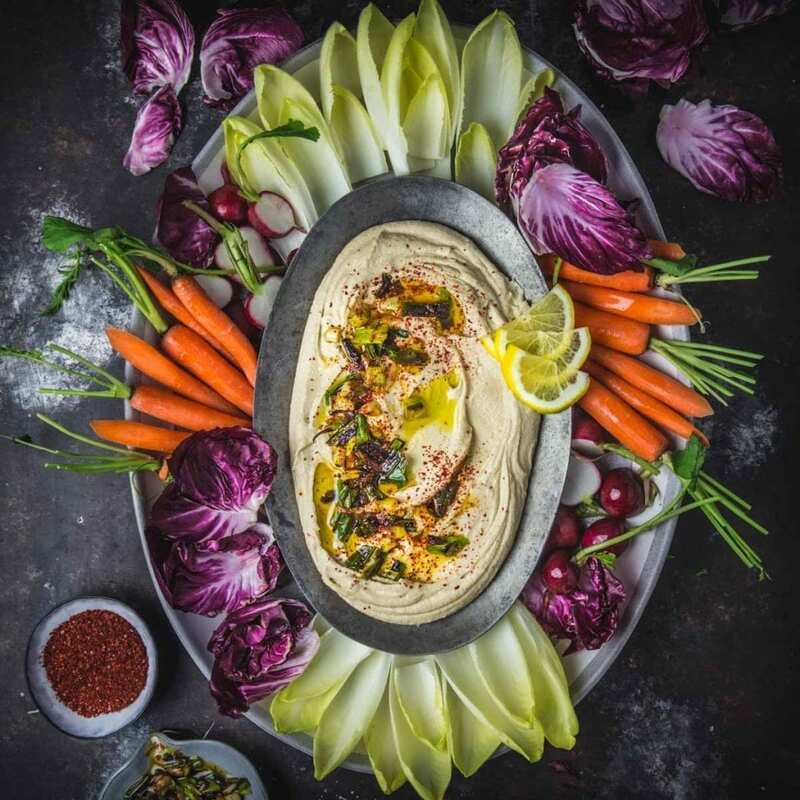 Serve with crackers, warm pita bread, or like we did, with a few fresh dipping veggies! In a large bowl, cover chickpeas by at least 3 inches of cold water and stir in 1 teaspoon baking soda and 2 tablespoons kosher salt. Let soak at room temperature overnight. Drain and rinse with cold water. Place the soaked chickpeas in a large Dutch oven or pot. Add the other teaspoon baking soda, 1 tablespoon kosher salt and 6 cups water and bring to a boil over high heat. Reduce to a vigorous simmer, cover with lid slightly cracked, and cook until very tender, to the point of falling apart, about 1 - 1½ hours. Add more water if needed to keep the beans completely submerged at all times. Drain. While the chickpeas are cooking, make the Tahini-Miso sauce: In a blender, purée the lemon juice, garlic and ¼ teaspoon kosher salt until the garlic is completely broken down. Let the lemon-garlic mixture sit in the blender for 10 minutes. Add the tahini, miso and cumin, and blend until a thick paste forms. Slowly drizzle in ⅓ to ⅔ cup ice water while the blender is running, a little at a time, until the sauce becomes very smooth and creamy. Add the hot, drained chickpeas to the blender with tahini-miso mixture. Starting on low speed and working up to high. blend until perfectly smooth, stopping to scrape down sides of blender occasionally, 1 -3 minutes. Keep blending until the mixture is ultra-creamy and fluffy, adding a little water, if needed to make the mixture blend. Taste for seasonings, adding more salt, lemon juice and/or cumin as needed. Transfer hummus to a bowl or sealable container and allow it to cool to room temperature. While the hummus is cooling, make the Spicy Charred Scallions: Heat a large, heavy skillet (cast iron is perfect) over medium-high. Add 1 tablespoon oil and the scallions, season with kosher salt, and cook, turning occasionally, until softened and deeply charred, about 4 minutes. Transfer the scallions to a cutting board and cut them into ½ inch pieces. Add to a bowl and drizzle with more oil and the gochugaro. Season with kosher salt and black pepper, to taste. 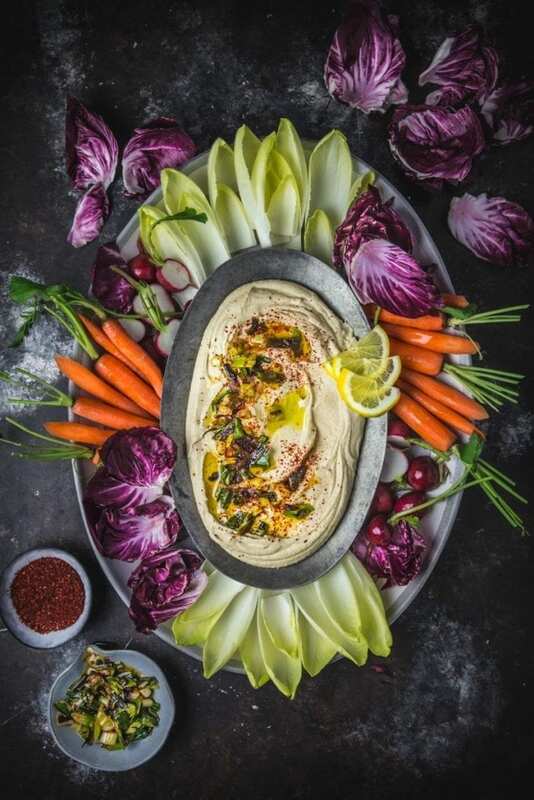 To serve, spread the hummus on a plate using a large spoon, swirling the top to make a few furrows. Top with the charred scallions, a sprinkle of extra gochugaro and a drizzle of olive oil.